The Flow Chart Diagram is a strategic diagram that allows the steps in a process, workflow or algorithm to be ordered in a sequence and displayed graphically. 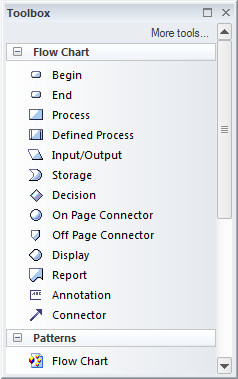 The steps are modeled as rectangles and choices are modeled as diamonds, there are inputs and outputs and data stores available for modeling the things that are consumed, produced and stored by the process. 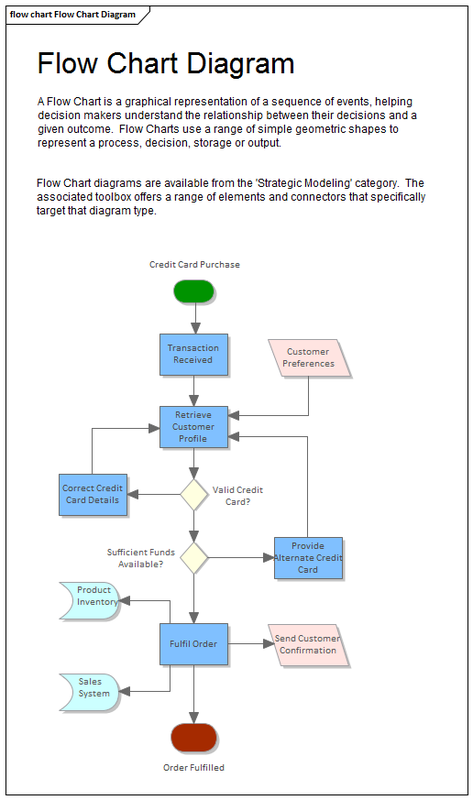 The Flow Chart Diagram can be used for visualizing, analyzing and communicating about the steps and outcomes in workflows, processes and computer algorithms. Flow Chart Diagrams can have nested Activities allowing hierarchies to be defined. Responsible parties can be defined by the use of swim lanes. The Flow Chart Diagram (like any diagram) can be viewed as an element list which makes working with the element's properties easier.